Gabriele Münter of the "Blue Riders"
I became an immediate fan of Gabriele Münter (1877-1962) about twenty years ago when I happened across her work in a group show at the Busch-Reisinger Museum on the Harvard University campus. That small exhibit included several charming vignettes and landscapes in an unusually appealing palette that was both bright and warm. Variations of purple, lime, teal, rose and other distinctly non-primary colors were included, and each tone was bordered casually in black, reminiscent of a woodcut print that had been hand-colored. 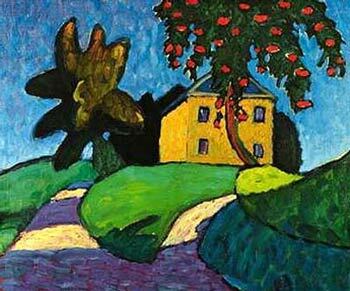 My next encounter with Münter was an eye-opening retrospective exhibit in Munich in the early '90s. You may barely have heard of her, except maybe as the lover of Wassily Kandinsky. But where, it is worth wondering, would Kandinsky have been without her? Where would the bold Blaue Reiter group experiments have ended up? 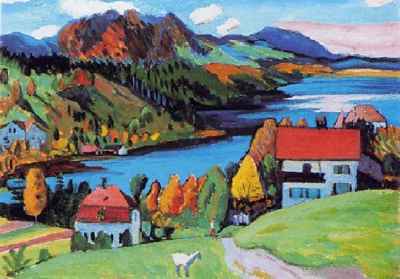 On one level at least, the importance of Gabriele Münter is undeniable. She played a huge role in the history of early German modernism for it was she who, despite political risk and financial privation, preserved hundreds of so-called "degenerate" paintings throughout the Nazi period, sneaking them out of Munich and hiding them in her rural retreat. Without Münter, most of the history of a pioneering modern art movement would probably have been lost. But is there more to her? Born in Berlin in 1877, Münter came into a modest inheritance by the time she was 20. She made the most of her freedom, travelling to America before returning to Germany to attend a series of art schools at a time when women were barred from public art academies. 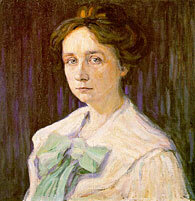 In 1901 she enrolled in the progressive Phalanx school founded by Kandinsky who, ten years older than her and married, had recently arrived in Munich from Moscow. . . . After several years in which Kandinsky and Münter pursued an unsettled, itinerant life together, the couple alighted upon Murnau in 1908. . . . It was there, she said, that "the great leap took place. It was like an awakening for me. I felt as though I were a bird in song." . . .
&#0;&#0;&#0;&#0;She was already accomplished as a painter, . . . but from 1908 she was experimenting restlessly; testing, adopting and discarding ideas. "When I begin to paint, it's like leaping suddenly into deep waters," she said. "I never know beforehand whether I will be able to swim." Rapidly she leaves the last vestiges of naturalism behind her. Putting down the palette knife, she picks up a brush, sometimes completing, it is said, as many as five pictures a day. Her simple forms and heavy outlines, her unmixed colours, forceful contrasts and flattened perspectives, speak of the bold intensity of her gaze. Sometimes her paintings sing with her high spirits, gleaming gem-bright against the startling yellow backdrop (apparently she decorated her house in this colour). Other, darker, paintings have a lowering intensity, a mood of sadness, even aggression. Intuitive spontaneity and freshness of response were certainly Expressionist credentials. And yet, despite her avid interest in folk art and her search to recover some sense of almost medieval authenticity, Münter is more than some gifted primitive. 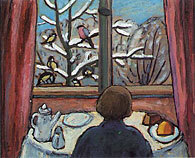 The 21 (mostly small) paintings here are carefully selected to illustrate the range of her influences, to reveal how she referred to her own experience as a designer of woodcuts, for instance, or developed the post-Impressionist technique of cloisonnisme (framing forms with dark outlines), derived from Paul Gauguin and taught to her by Jawlensky, or learnt from the Bavarian craft of glass painting. She was not an untrained naive but a self-aware artist. Her portraits are more than a precious record of the now famous group that gathered in Murnau. Their emotional impact arises from Expressionist principles. And these, too, are applied to her genre scenes and still-lifes. She imbues the most humble object with an almost spiritual dimension, the dimension her lover sought in his move to the abstract. . . .